In the preface of The Swerve: How the World Became Modern, Stephen Greenblatt recalls the day he encountered a translation of Lucretius' 2000 year old poem, On the Nature of Things. He was a grad student back at Yale, living on modest means, when he ambled into a bookstore and found a copy marked down to ten cents. He picked it up, not having much to lose and not knowing what he'd find. Soon enough he was reading one of the most scandalous and groundbreaking texts from antiquity, a book that eventually traveled a long and winding road and changed our entire modern world. That story Greenblatt tells in The Swerve. The ten cents Greenblatt spent in the 1960s may be roughly equivalent to the deal you can get today. 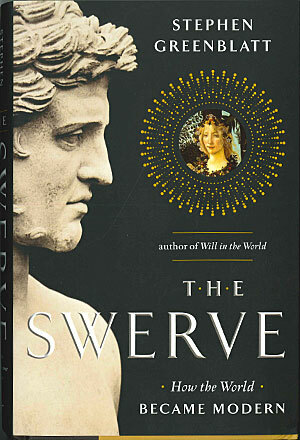 Right now, The Swerve, the winner of the 2012 Pulitzer Prize for general nonfiction, can be downloaded as an audio book for $5.95 via iTunes. Yes, we know, $5.95 is not free, and iTunes is not open, but it's certainly a deal worth mentioning nonetheless. But if you're really hankering for something free, then don't miss our meta lists of Free Audio Books and Free eBooks, which include a copy of Lucretius' famous work. Or definitely check out Audible.com's Free Trial offer, which lets you download pretty much any audio book you want (classic or modern) for free. Get details here.